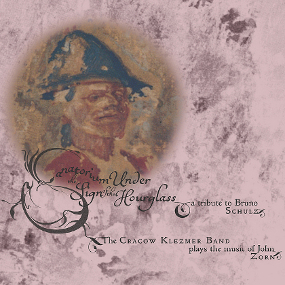 The Cracow Klezmer Band is one of the most passionate, virtuosic and creative bands in the New Jewish Renaissance and with each new release they just keep getting better and better. For their fourth CD on Tzadik they collaborate with John Zorn to paint a surreal vision of the work of Polish/Jewish writer Bruno Schulz, whose art and stories continue to fascinate and perplex the world. Blending a nostalgia for the past with a twisted view of the present, Zorn’s evocative and lyrical compositions and Jarek Bester’s sparkling arrangements blend perfectly, capturing the bizarre sensuality of Schulz’s fantastical stories. Featuring the beautiful vocalist Grazyna Auguscik on two tracks, Sanatorium Under the Sign of the Hourglass is a CD of driving rhythms, soaring lyricism, textures, moods and amazing colors, and pays tribute to one of the world’s most enigmatic and under appreciated geniuses. This is a CD you will return to again and again.